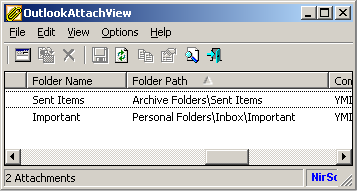 OutlookAttachView now allows you to search Outlook attachments only in the folders that you choose, instead of scanning the entire mailbox of Outlook. 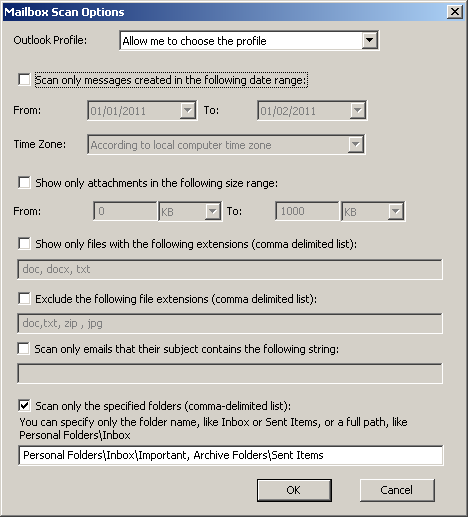 Currently, there is no user interface to choose the desired Outlook folders (It’s possible that I’ll add ‘Choose Folders’ window in future versions), so you have to manually type the list of folders that you wish to scan, as comma-delimited list. You can type only the folder name, for example: Inbox, Sent Items, and so on. If you type ‘Inbox’ as the folder name and you have multiple Inbox folders in your Outlook profile, all your Inbox folders will be scanned. Posted by NirSoft on January 29, 2011 at 10:21 am under Utilities Update. The new versions of WhoisThisDomain and DNSDataView utilities allow you to type domain names which contain non-English characters (internationalized domain names). when you type a domain with non-English characters, it automatically converted to its Ascii form (Which looks like xn--aaaaaa.com) before sending it to the Whois/DNS server. so this new feature may not work on systems prior to XP/SP2. You can check whether your Windows OS supports IDN by searching for normaliz.dll inside your system32 directory. If this file exists, it means that your system has IDN support. Posted by NirSoft on January 28, 2011 at 1:13 pm under Uncategorized. Happy New Year To All NirSoft Users ! I originally planned to start the first day of this new year with “Happy New Year” greeting for my users (Which I added in the title of this post) and a list of new utilities that will be released in the incoming year. However, because there are already many existing utilities that I have to update, the planning and development process of new utilities is much slower than before. Currently, there are 2 new utilities that are in development process and other ideas for utilities that are still in ‘planned’ status and I still don’t know whether they are going to be created. WhatIsHang (In development): Sometimes, a Windows software hangs, the user interface doesn’t respond anymore, and you cannot find out what is cause for the problem (In fact, even my own utilities may hang in some circumstances). This new utility will try to detect the software that is currently hang, and it’ll display some information that may allow the user to understand what exactly cause the software to hang. In the above example, I tried to open Notepad with a file on a network drive that cannot be accessed (z:\temp\temp.ini) and Notepad stopped responding. The prototype of WhatIsHang detected that notepad doesn’t respond, and displayed the ‘z:\temp\temp.ini’ filename string that was found in the stack, which is really the cause of the problem. 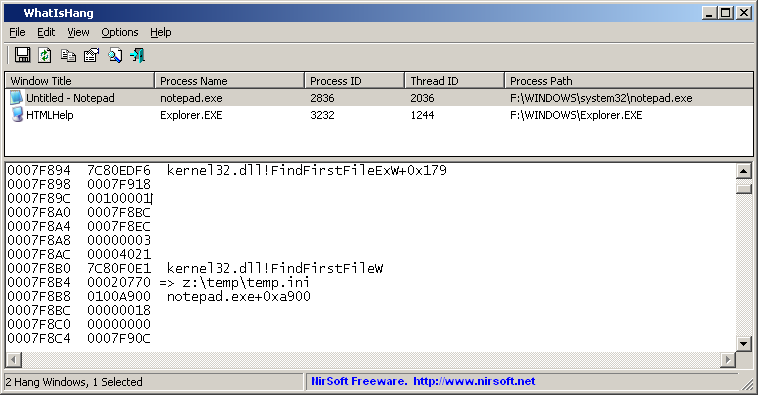 I’m also considering to create a similar utility for detecting application crash problems. The idea behind this tool is to allow one person to check whether other people (family members, friends, or employees) use passwords that are secured enough (and warn them if they are not), but without having the ethics problem of watching the passwords of others. Network statistics utility (planned): Many people requested to add more information into my CurrPorts utility, like number of sent/received packets, total packets size, and so on. However, this information cannot be added without a using device driver. Also, CurrPorts is only designed to display TCP/UDP information, while there are other types of network packets that won’t be displayed by CurrPorts.The new network statistics utility (If I’ll really create it) will capture every packet on your network adapter with WinPCap driver or with Microsoft Network Monitor Driver. it’ll detect the protocol, addresses, and ports of the packet, and then it’ll be updated in the statistics table that will display the number of packets, data size, data speed, and other information for every protocol/network address. Wireless networks statistics utility (planned): A utility that will capture all wireless raw packets while the wireless card is in ‘Monitor Mode’ and will display general statistics about the wireless activity in your area, including number of packets, packets size, packets encryption, and so on. The main problem with creating this utility is that ‘Monitor Mode’ is only supported starting from Windows 7/Vista (with Microsoft Network Monitor Driver), so if I develop it, many Windows XP users won’t be able to use it. And… as far as I know, WinPCap driver cannot capture raw wireless packets under Windows, unless you use their AirPcap product, which is very expensive. Simple Network Inventory Tool (planned): a simple tool that will collect basic hardware/software information from multiple computer on your network, like disk size, memory, processor name, Windows service pack/version, IE version, Firefox version, and so on… and it’ll display it in a simple flat table to easily view and compare the software/hardware that you currently have on your computers. Password Recovery from external drive (planned): I constantly get requests from people that their old drive cannot boot anymore and they want to extract their passwords from it. Some of my password recovery tools can already do that, and others cannot. I’m considering to create one tool that will be able to extract most types of passwords from external drive, but… because Microsoft made a significant change in their password encryption starting from Windows 7, my current code cannot extract the passwords of Windows 7 from extenal drive, and upgrading my code to work with Windows 7 might be a long process. Posted by NirSoft on January 1, 2011 at 1:04 pm under Utilities Update.